The Rainbow Women's Chorus (RWC) works together to develop musical excellence in an atmosphere of mutual support and respect. We perform publicly for the entertainment, education, and cultural enrichment of our audiences and community. We sing to enhance the esteem of all women, to celebrate diversity, to promote peace and freedom, and to touch people's hearts and lives. In addition to performing two concerts each year, RWC puts an emphasis on outreach, singing all over the Bay Area at venues such as San Jose City Hall, Santa Clara County offices, World Aids Day, San Jose Museum of Art, San Jose Opera (Lobby holiday performance) Genentech and Oracle Corporations' diversity celebrations, as well as in churches, at festivals, in celebrations, weddings and funerals. Ruth Huber was instrumental in founding both RWC and Tapestry Singers (the Austin Women’s Chorus). She holds three music degrees, including a Master of Music in Composition from the San Francisco Conservatory, and has studied conducting at San Jose State University. Her compositions and songs have won awards from the American Choral Directors Association, the San Francisco ArtSong Competition, and the Austin Music Umbrella Songwriters Competition, and she receives commissions from choral groups around the country. A certified member of Music Teachers National Association, she teaches piano, serves as Music Director for Campbell United Church of Christ and resides in San Jose with her wife, Brenda Meng, and an assortment of adorable cats. Betsy Wagner has a Bachelor’s degree in Music Education with a dual major in voice and piano. She has recently retired from 35 years teaching music to K - 12 students, the past 27 years leading the award-winning choir program at Morrill Middle School. Betsy has been singing with Rainbow Women’s Chorus since 1997 and has been co-director since 2000. She creates the choralography for RWC performances. In 2003, she helped found RWC’s small ensemble, Vocal InFusion. According to her mom, her natural musical ability showed up at the early age of two, when she played “Twinkle, Twinkle Little Star” by ear on her toy piano. In this first year of her retirement, she has conducted a third and fourth grade Crystal Children’s Choir, and dusted off her high school clarinet to play with the Milpitas Community Concert Band. Action Circle members need not be singers; if you have an interest in nurturing a young, thriving performing arts organization and would like to be a part of the Action Circle or one of its committees, please contact us for more information. Rainbow Women's Chorus was founded in October 1996 as a project of Silicon Valley Gay Men's Chorus. San Jose didn't have a women's chorus and SVGMC started the ball rolling. RWC's first performance was as guests of SVGMC. 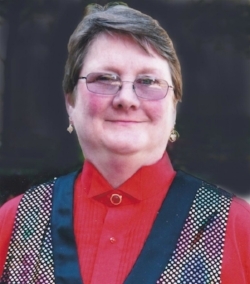 Our first director was Lynne McLaughlin, former artistic director of SVGMC. The following January, Ruth Huber, artistic director of Tapestry Singers in Austin, joined RWC as co-director. In 2000, Betsy Wagner became co-director when Lynn McLaughlin moved to New Mexico. In 2000, RWC and SVGMC were the proud co-hosts of GALA Festival 2000, GALA Choruses' quadrennial festival event, bringing gay and lesbian choruses and their supporters - over 5000 participants from around the world - to San Jose for eight exciting days of singing, workshops, entertainment and mutual support. We have participated in every GALA Festival since: in Montreal in 2004, Miami in 2008, and GALA Festivals 2012 and 2016 in Denver. We look forward to participating in GALA Festival 2020 in Minneapolis. In 2003, RWC formed a small ensemble, Vocal InFusion (VIF). VIF is an 8-member auditioned group that gives an opportunity for select chorus members to raise their performance up a notch, singing more challenging music. In 2004, RWC recorded our first CD, Rainbow Women, Comin' Home, an "in concert" recording of some of our favorite songs. It also showcases the Festival 2000 recording of Ruth Huber's landmark commissioned piece, Rainbow Bridge, sung with SVGMC. In 2006, members of RWC sang at Carnegie Hall in New York City with a dozen other choruses for a breast cancer and HIV benefit. In 2010, over the long July 4th weekend, RWC traveled to the Sister Singers Music Festival in Chicago for more exciting music, informative workshops - and FIREWORKS! In 2017, (as part of the 2016-17 season) RWC celebrated our 20th anniversary with a joyous concert of favorites old and new. We received congratulatory awards from the San Jose City Council and from GALA Choruses. View our previous concert programs to see what we've been singing through the years.